Tag Archives: Dale Earnhardt Sr.
Late this past October, 101 Ranch Records re-issued country artist Mark Collie’s 2012 live recording Alive at Brushy Mountain State Penitentiary on CD. The recording, originally released in 2012 is an important piece of the singer’s catalogue. That is because it is a recording that almost didn’t happen as is pointed out in the recording’s companion booklet. The booklet, by the way, is the recording’s key element. That is rare for a live recording and will be discussed shortly. The show’s set list, by connection, is just as important to discuss as the recording’s companion booklet. The band’s performance of the show’s set list rounds out its most important elements. Each element is important in its own right to the recording’s presentation. All things considered, Alive at Brushy Mountain State Penitentiary is a piece that Mark Collie’s fans will appreciate just as much as country music fans. 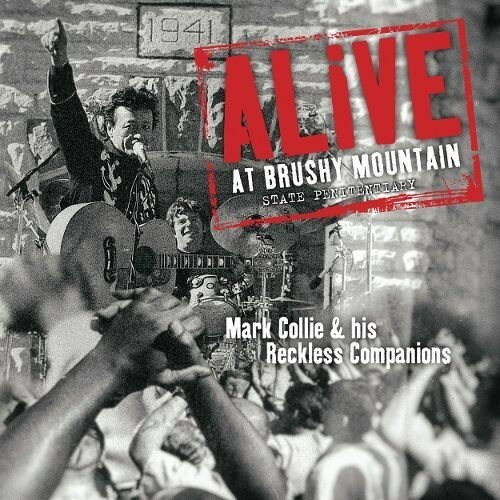 Eagle Rock Entertainment’s recent re-issue of Mark Collie’s Alive at Brushy Mount State Penitentiary is a work that Mark Collie’s fans and country music fans alike will appreciate. That statement is supported primarily through the recording’s companion booklet. It is pretty rare for a live recording’s companion booklet to take precedence over its set list or even the band’s performance of said set list. But this recording proves that a recording’s booklet can be its most important element. The booklet is so important because of the history lesson that it presents. It reveals the set list, save for just one song—‘Rose Covered Garden’—was new material at the time of the concert’s recording. Speaking of the concert’s original recording, audiences will learn through the booklet that the concert was originally recorded on October 17, 2001 and it almost didn’t see the light of day. That was due to legal reasons. But luckily it did finally see release in 2012 through an independent source. That’s just some of the important material presented in the recording’s companion booklet. Audiences will also be interested to learn that it was Johnny Cash’s Folsom Prison performance that influenced Collie to eventually hold his performance at Brushy Mountain State Penitentiary. There is also a relatively in-depth history of the prison itself, including the revelation that it once held James Earl Ray, the man responsible for the death of Martin Luther King, Jr., and in The Silence of the Lambs, it was the prison that held the story’s villainous antagonist, Hannibal Lecter. This and so much more presented throughout the booklet proves why it is so important to the overall presentation of Alive at Brushy Mountain State Penitentiary. Whether one is a seasoned Mark Collie fan or new to the veteran musician’s work, it is highly recommended that audiences in general read through the recording’s companion booklet before even taking in the concert itself. Alive at Bushy Mountain State Penitentiary’s companion booklet is clearly an important piece of the recording’s overall presentation. Regardless of audiences’ familiarity with Collie’s body of work, it is recommended that every listener read through the recording’s companion booklet before taking in the concert. It is that important to the recording’s overall presentation. While the recording’s booklet is highly important to the whole of Live at Bushy Mountain State Penitentiary, it is not the recording’s only important element. The set list is important in its own right to the recording’s presentation. It has already been noted that the material presented in this concert was largely original save for just two of its songs. Those songs are ‘Rose Covered Garden’ and the group’s cover of Johnny Cash’s ‘Folsom Prison Blues.’ That is extremely important considering that the show’s “new” songs were not included in any of Collie’s prior recordings or recordings put out since. ‘Rose Covered Garden’ was included in one of Collie’s previous albums while ‘Folsom Prison Blues’ is one of Johnny Cash’s songs, and audiences won’t find it on any of Collie’s previous albums, just as with the “new” songs. That makes this set list extremely special. That’s just part of what makes the set list so important to note. Audiences will also be surprised to learn through the concert’s interludes that at least one of the songs included in the set was written by one of the inmates housed at the prison at the time of the concert. It is impressive to learn that Collie would show such interest in his audience as to put one of their songs on display. As simple of an action as it was, it was an action that had to have meant a lot to that inmate and the others. It’s the type of action that can truly establish a connection between performer and audience. No doubt it did just that and more. Taking into consideration the largely original set list and that Collie and company would even use one of the inmates’ songs for the set, it becomes fully clear why the recording’s set list is just as important to note as its booklet. It is just one more item that makes this recording shine, too. The band’s performance of the set list rounds out the recording’s most important elements. Both the companion booklet included in Alive at Brushy Mountain State Penitentiary and the recording’s set list are key to the recording’s presentation in their own right. The booklet is key as it presents an in-depth introduction to the concert and the prison. The set list is important to the recording because save for just one of its songs, none of its songs are presented in any of Collie’s previous studio recordings. They haven’t been included in any recording since. It even includes at least one song crafted by one of the inmates housed at the prison at the time of the concert. Both of the elements noted within the show’s set list makes it just as important as the recording’s booklet to the concert’s overall presentation in its new re-issue. While both elements are clearly important in their own right to the recording, they are not its only important elements. The band’s performance of the set list is important in its own right. The concert is currently available only on CD, but the band’s performance is so easy to visualize because it feels so genuine. Between the group’s performance of the song’s and Collie’s rapport with the inmates, the whole performance feels so genuine. At one point, he even jokes with the inmates about something he’s drinking not tasting like a certain kind of beverage. What kind will be left for audiences to discover for themselves. It is a wonderfully entertaining moment, though. The group’s performance of ‘On The Day I Die’ is another example of what makes the groups performance so powerful. This song comes across in such a heartfelt manner that it will bring tears to any listener’s eyes. It is that moving. It’s one of those performances that absolutely must be experienced for one’s self in order to fully understand and appreciate the emotion in the performance. Of course one can’t ignore the group’s take on Johnny Cash’s famed ‘Folsom Prison Blues.’ One can’t help but wonder what Mr. Cash might have thought if he were to have had the opportunity to hear the group’s take on the performance. It likely would have made him proud. It is that solid, even being played at a different prison. Between these moments and so many others, throughout the concert, it is clear that the group’s performance (both in terms of the songs and in terms of its interaction with the inmates) completely entertained the inmates and the guards. It will entertain listeners just as much, too. When it is set alongside the show’s set list and its companion booklet (and even the liner notes printed inside the case), the whole of this recording proves to be an outstanding recording. If it had been a new release, it would have made this critic’s list of the year’s top new live recordings. Even being a re-issue, it is still a recording that country fans across the board will appreciate regardless of their familiarity with Collie’s body of work. The weather is still cold around most of the country. But America’s premier racing series is warming up its engines. NASCAR will return to the track this weekend. 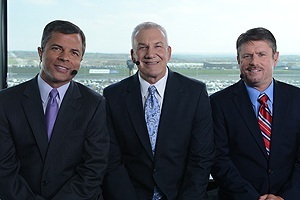 And ESPN will be there with two full weeks of coverage culminating in a broadcast of the NASCAR Nationwide Series season opener on Saturday, February 23rd. The network’s coverage will span its family of networks, as well as its digital and print outlets. As an added bonus, the winner of this year’s Daytona 500 will appear on a variety of ESPN telecasts the day after the Sprint Cup Series’ season opener. ESPN’s coverage of the Nationwide Series begins with live coverage of Nationwide practice on Thursday, February 21st at 3pm EST and qualifying Friday, February 22nd at 3:30pm EST. Its broadcast of the season opening 300-mile race live from Daytona International Speedway begins at 12pm EST on February 23rd with the race itself beginning at 1:15pm EST. The race will be called from the booth by Allen Bestwick. He will be joined by ESPN analysts Dale Jarrett and Andy Petree. The pits will be covered by Dave Burns, Jamie Little, Dr. Jerry Punch, and Vince Welch. The countdown show will be hosted by Nicole Briscoe. She will be joined by Rusty Wallace, Ray Evernham, and Brad Daughetry. This week and next week will be front loaded with all the coverage that any member of the NASCAR Nation could want. A complete schedule of coverage across the ESPN family of networks is available below. To keep up with the latest entertainment news and reviews, go online to http://www.facebook.com/philspicks and “Like” it. Fans can always keep up with the latest entertainment news and reviews in the Phil’s Picks blog at https://philspicks.wordpress.com. ESPN is known as the worldwide leader in sports. There’s a good reason for that. The release of the network’s “ESPN Films Volume 1” box set last year is an excellent example of what makes ESPN truly the worldwide leader in sports. Now with the recent release of the “30 for 30” Limited Edition Collector’s Set on blu-ray, ESPN has proven its reputation even more than ever. This collection includes all thirty films from the original DVD and blu-ray sets released in 2011, and adds in a nice piece of memorabilia to sweeten the deal. All together, they make up what is easily the best box set of the year. ESPN’s “30 for 30” Limited Edition Collector’s set on blu-ray boasts all thirty films from the originally released sets. Choosing just one film from the set as the best is impossible. Each viewer will have his or her favorite film from the six disc set. There are, however, at least a few films that that stand out to this individual as standing out as some of the set’s best. One of those films jumps into the world of baseball, in “The House of Steinbrenner.” “The House of Steinbrenner” follows the final days of the old Yankee stadium and the early days of the new stadium. Along the ride, audiences are given a history on the man who brought the Yankees and their historic stadium to prominence. The stories shared by players and fans alike of the old Yankee Stadium show a true love of the structure. It was more a living, breathing museum than just a stadium. It was a place where cultures crossed and everybody lived in harmony. That’s because they were all one. They were all Yankee proud. The reactions to its final days make the mixed reactions to the new Yankee Stadium that much harder hitting. The mixed views on Steinbrenner are just as interesting. One former Yankee player worded it best in saying that in regards to Steinbrenner, “you loved him and hated him in the same breath.” Interviews with players, fans, journalists, and even Steinbrenner himself give an unexpected view of “The Boss.” The interviews shared in “The House of Steinbrenner” show a man who understood business and who also understood the fans. They show that perhaps Steinbrenner’s only true flaw was that he cared too much about his team. The George Steinbrenner presented in this film was a very shrewd business man. He was also a devoted fan among fellow fans. He wanted the team to win. He wanted it for the fans and for himself. That inability to ever fully balance business and fandom was ultimately why he was such a polarizing figure. Despite his bad reputation among countless legions, just as many were and are still devoted to him today. Love him or hate him, George Steinbrenner has forged not only his legacy, but that of the Yankees, too. He will never be forgotten for that. That’s especially the case now, with this incredible film. George Steinbrenner was polarizing, to say the least. But he’s not the only figure of such stature featured in the new “30 for 30” blu-ray re-issue. Another of the interesting figures featured in the set from an entirely different world. His name is Tim Richmond. In the film, “Tim Richmond: To the Limit”, director Rory Karpf follows the life of NASCAR legend Tim Richmond. Richmondwas obviously polarizing. He was polarizing in that he was the immediate antithesis of NASCAR’s old guard. He was the rock star of the racing world at that time. He had an innate ability to drive the wheels off of any race car, both in open wheel or stock car. He proved that he could have been the future of NASCAR. Sadly, after being diagnosed with AIDS, his meteoric rise was cut short. Fans are reminded in this film of the stigma attached to AIDS because of the lack of knowledge surrounding it at that time. It shows just how far the world has come since then. Unluckily for him, the world didn’t have that knowledge that people have today. 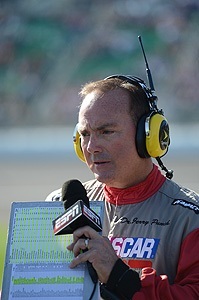 As a result, viewers learn that he was forced to cover up the illness, in hopes that he’d be able to return to racing one day. That obviously didn’t happen. In the time since the passing of Tim Richmond, the reputations of both NASCAR and AIDS victims has greatly changed. There is no denying that Tim Richmond played at least some role in that change. And it’s thanks to this film that his role in both the AIDS and NASCAR community will always be remembered. The films included in the new “30 for 30” blu-ray re-issue focus on many famous figures in sports. But they also focus on who teams. And just like George Steinbrenner and Tim Richmond were polarizing figures, so was the SMU football team a polarizing unit. It was thanks to the Mustangs’ infamous 1987 “death penalty” that the NCAA established the reforms that govern college sports today. In “Pony Express”, director Thaddeus D. Matula takes viewers into the scandal that rocked the sports world as a whole. It killed not one, but two of the university’s football seasons in a row. The film does note that the second dead season was self-imposed by the university. And it all started thanks to one player. One might think that by the film’s end, the story’s over. That’s anything but the truth. Video footage from ESPN, along with voice snippets, show that even today, universities have either not paid attention to the SMU scandal or have forgotten it. It is interesting to note that one individual interviewed in this film states that the NCAA would likely never use the “death penalty” again on another team. But considering that recent number of scandals that have rocked universities across the country, maybe the NCAA should reconsider using it. After all, it was once said that those who forget the past are doomed to repeat it. The documentaries featured in this blu-ray re-issue are just a drop in the bucket of what makes it a great set for any sports fan. Combined with the remaining films in the set, and the bonus ESPN hat, this new “30 for 30” blu-ray re-issue has easily made itself the best box set of the year. It can be ordered online now at http://ESPNshop.com. To keep up with all the latest entertainment reviews and news, go to http://www.facebook.com/philspicks and “Like” it or its companion page at http://www.facebook.com/pages/Reel-Reviews/381028148587141. Fans can always keep up with the latest entertainment reviews and news in the Phil’s Picks blog at https://philspicks.wordpress.com.